As if I could pass this book up after looking at that cover *^_^* Well, ok, this book was actually a gift, but believe me, if I had seen it at a manga store myself, I would have snapped it up too 😀 I really love OOYA Kazumi’s works! Her stories are cute, and the way she draws guys is just so… wonderful! I don’t know why I like her guys so much. Her art style in general, especially in her older works, is very scratchy/wispy, and she doesn’t really draw many backgrounds, but there is something about the way she draws guys. I think it’s their eyes. I can’t resist them! 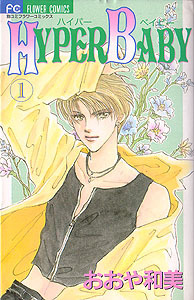 😀 Hyper Baby is a 4-volume series. This story starts off with some rather mysterious, shadowy men talking about how something important has been born, and how they must find it. We soon see what they are talking about when we meet our heroine, Maria. Maria is a high school student, and is on her way to visit her sister in the hospital. Maria’s sister has just given birth to a baby boy, so Maria is a new Aunt! But things soon start to get strange when Maria sees a strange (but extremely cute) boy at the hospital who is very interested in Maria’s new nephew. The boy always seems to be hanging around, and only Maria seems to be able to see him! Is he a ghost? A demon? Why is Maria seeing him? As if this wasn’t strange enough, Maria soon meets another (extremely hot) guy in the lobby of the hospital. He is tall and rather suave-looking, and has a bouquet of roses. He is also interested in the birth of Maria’s nephew, and gives Maria the flowers. Maria is obviously confused about all this attention little Masaki (her nephew) is getting. Who are these strange guys?! The first guy she saw appears again later at Maria’s own house, in Masaki’s nursery! Maria is shocked to see the boy materialize right out of baby Masaki’s body! What is going on?! Was it a dream?! Why is this boy appearing from within the baby? He is begging Maria to protect her nephew, but he doesn’t say from what. He also wants her to meet someone named Ichirou KOUZUKI. Who is that? Is he that other guy at the hospital? Why is everyone so interested in Maria’s nephew? This is a very fun supernatural story!